Here we are back at the house on Irongate Street for the last segment of the project. 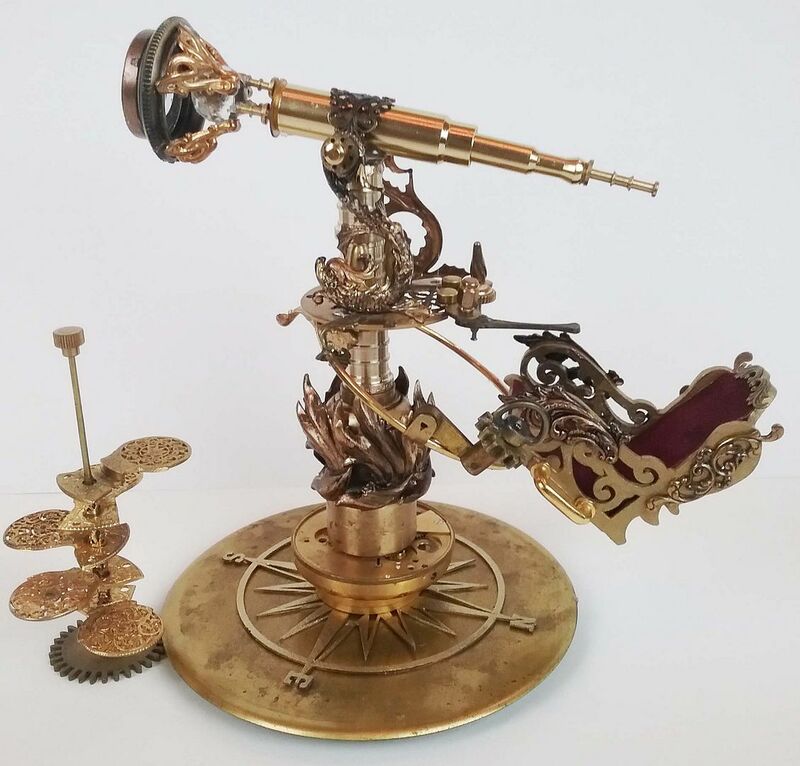 Since H.G is a explorer I thought she might explore the stars as well as the planet, to this end I’ve a created telescope that sits on the roof. 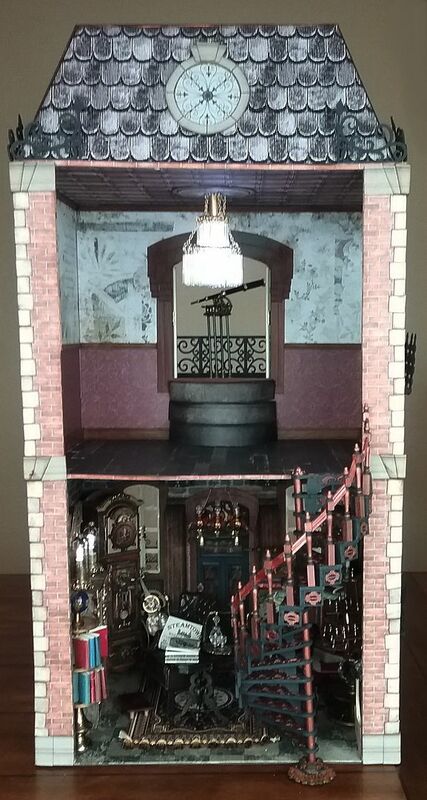 In addition, I've built and elevator that will take Helena to the roof. On a clear night you can sit in a comfortable chipboard chair lined with burgundy suede. 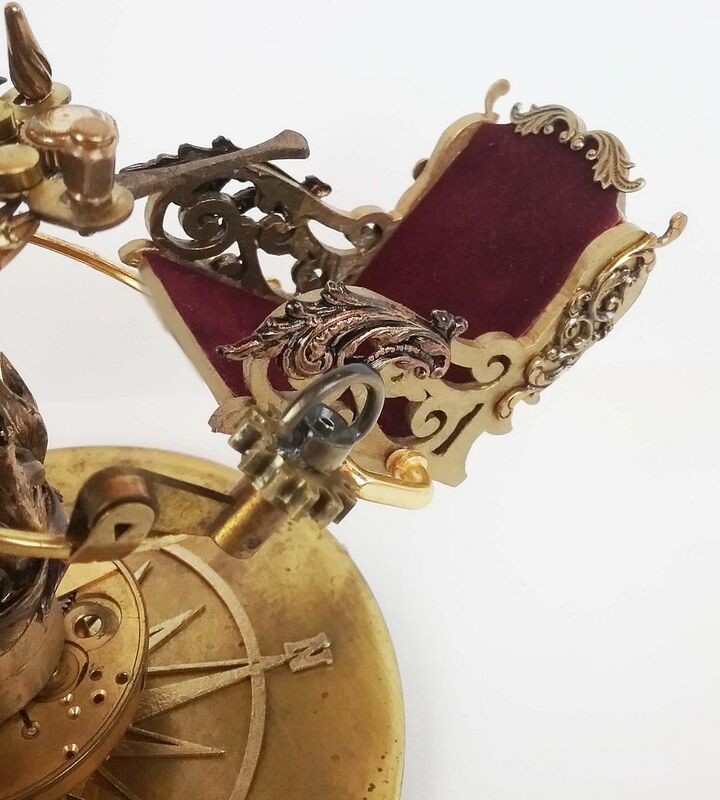 Mounted on the base is a chipboard compass which comes in handy for positioning the telescope. 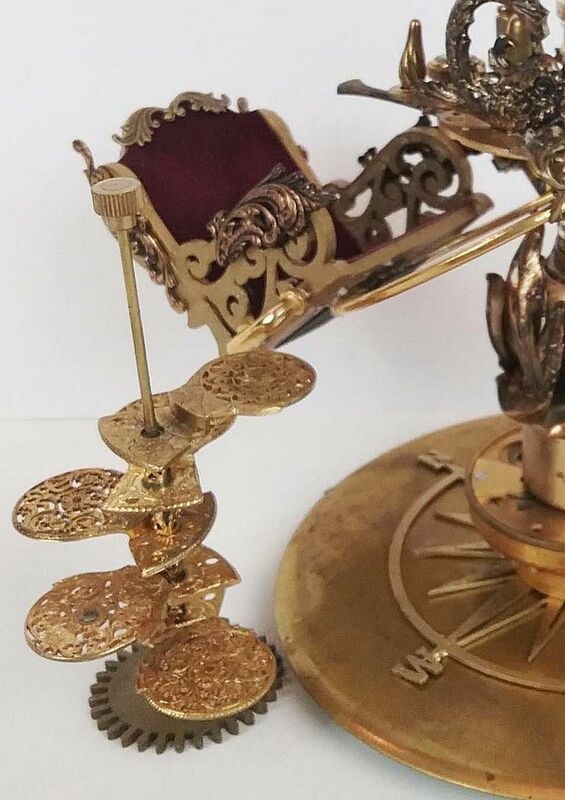 The lever on the side of the chair allows you to control the height of the chair. 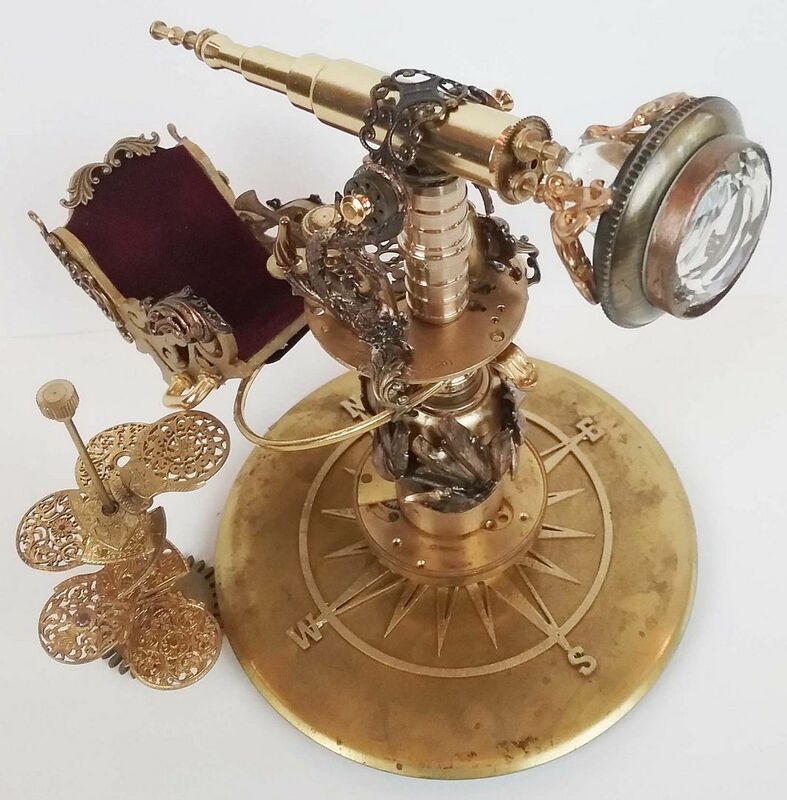 The chair is attached to the telescope using a bangle bracelet and a brass box foot. 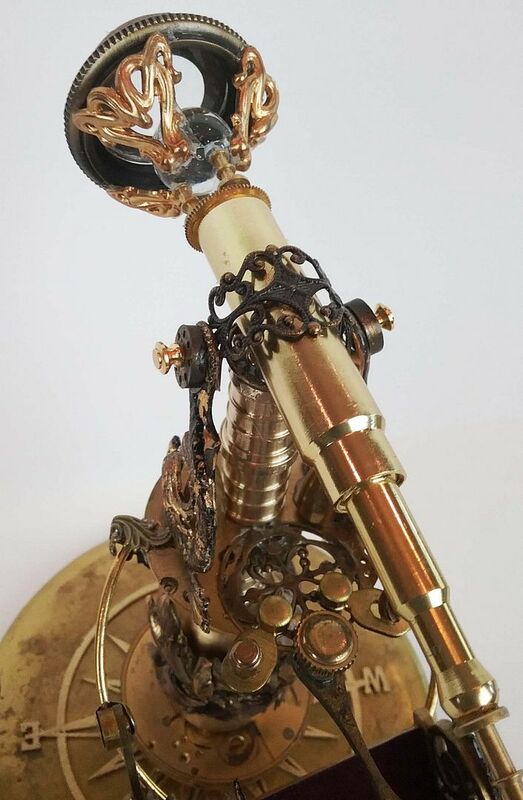 The controls (octagon pendant drop & fluted dangle) mounted in a brass compass are used to adjust the lens (glass marble & pocket watch cover) and telescope position. 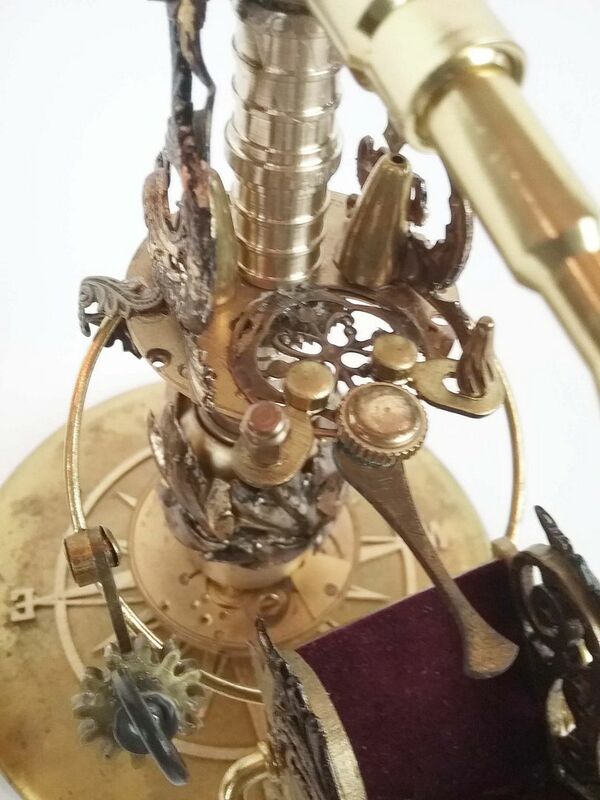 A piece of thin ornate filigree helps to keep the telescope in position. 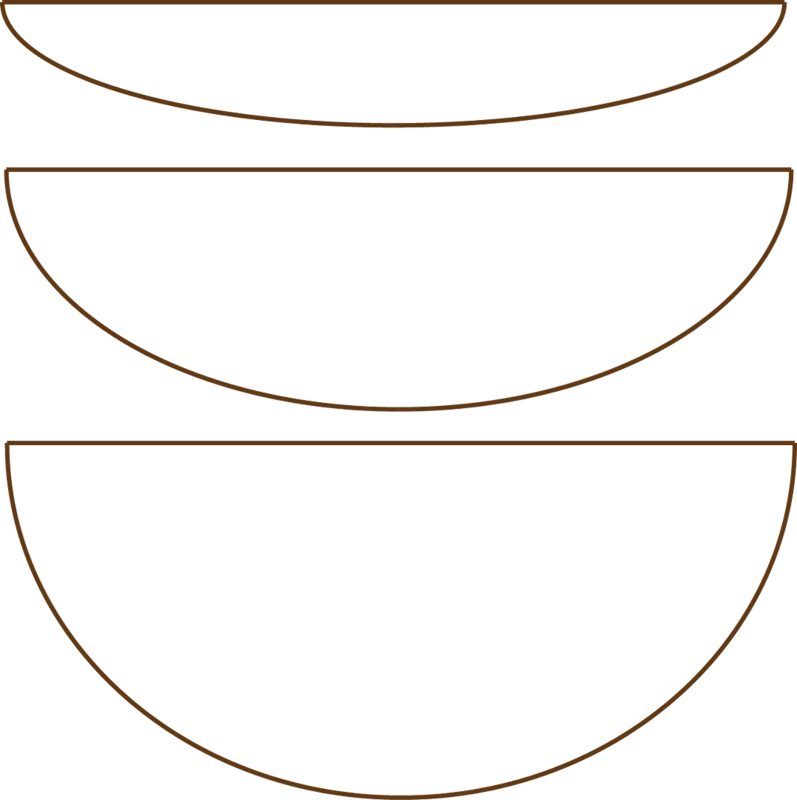 Both the base and the center section independently swivel. 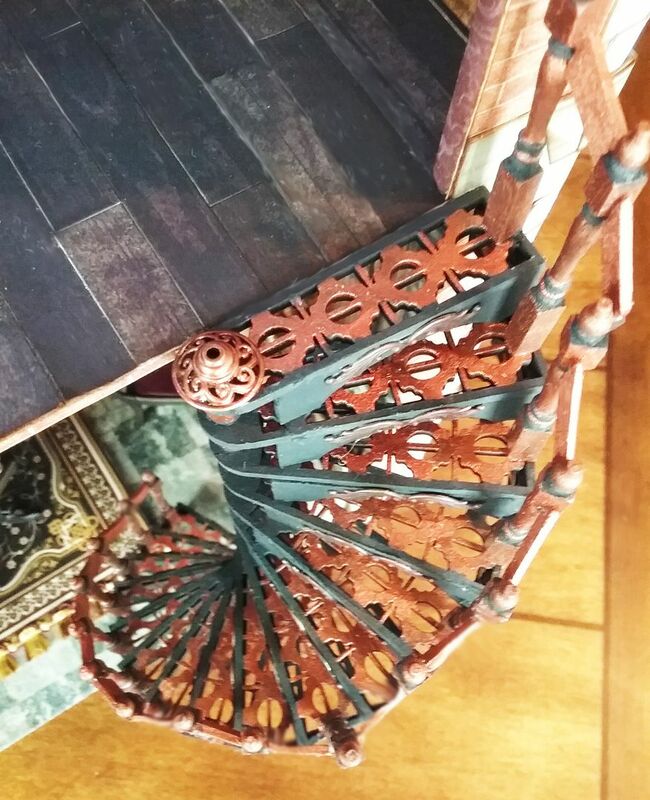 A lovely filigree spiral staircase makes it easy to climb into the chair. 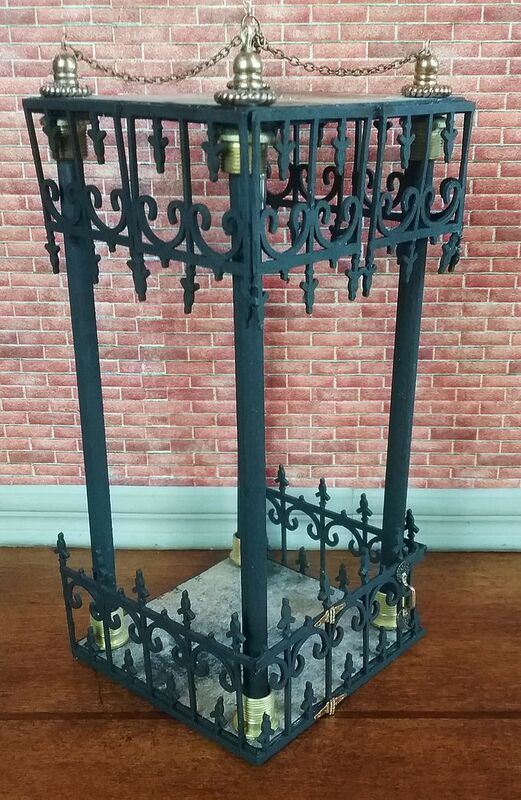 On the side of the house is an elegant wrought iron (made from Gothic border trim) elevator cage. On the front of the cage is an entry gate. 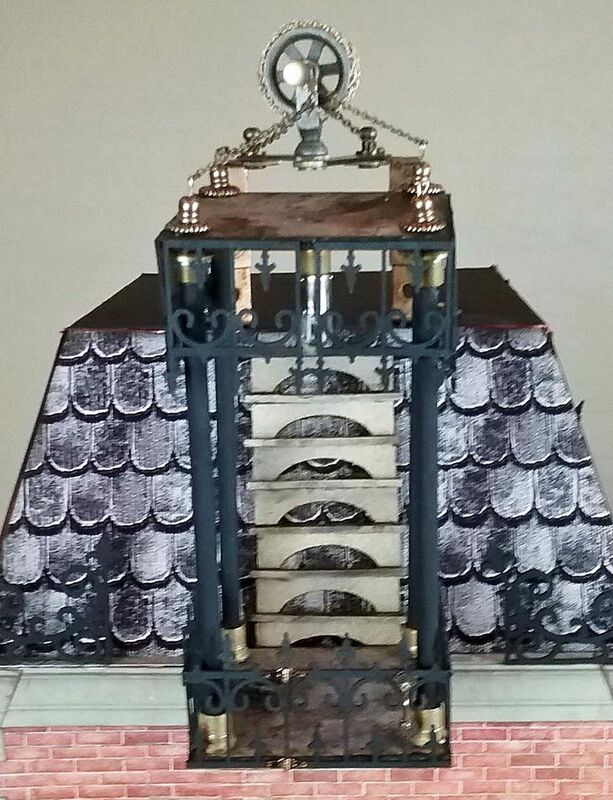 On the top of the roof is a pulley system that raises the cage to the bottom of the roof. 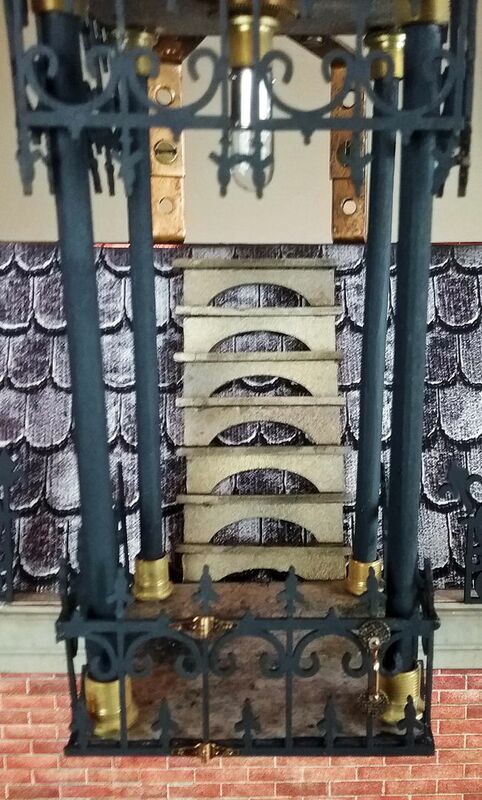 Once level with the roof, you'll find chipboard filigree stairs leading up to the top of the roof. 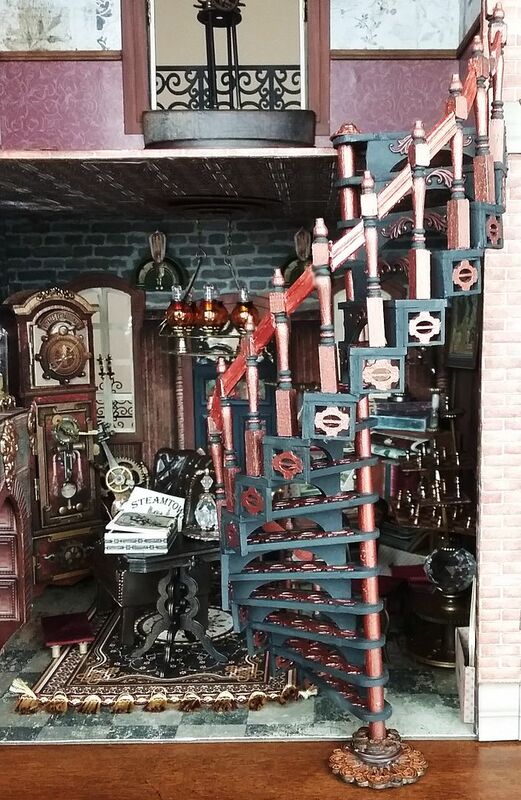 These stairs are made using the set of extra steps for the spiral staircase. The light inside the cage is helpful on dark nights. 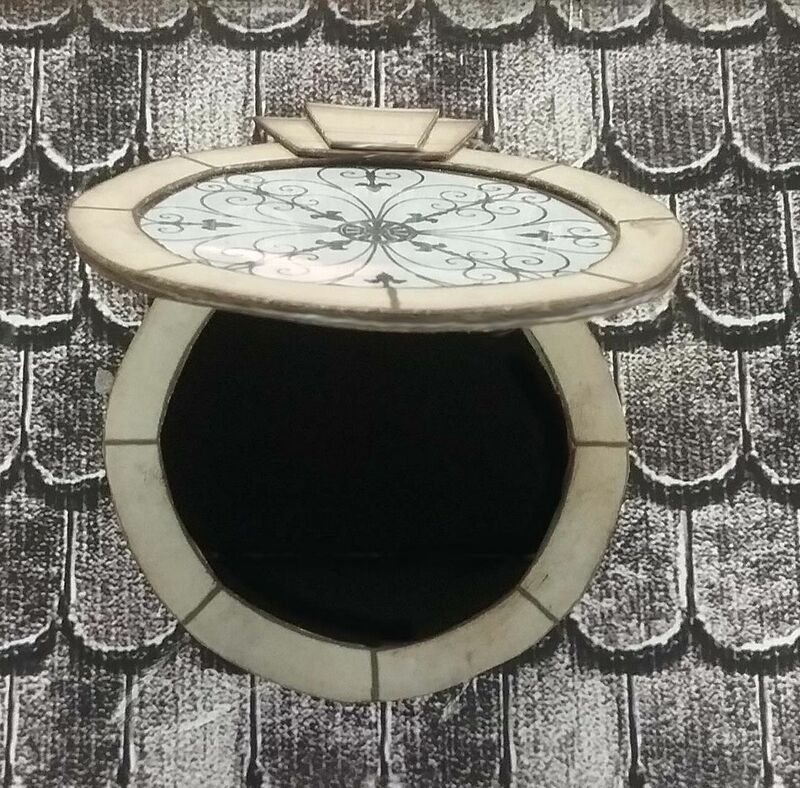 In addition to the video tutorials covering the construction of the telescope and elevator, I’ve also demonstrated how to create a hidden opening in the roof that allows for access to lighting switches and batteries. 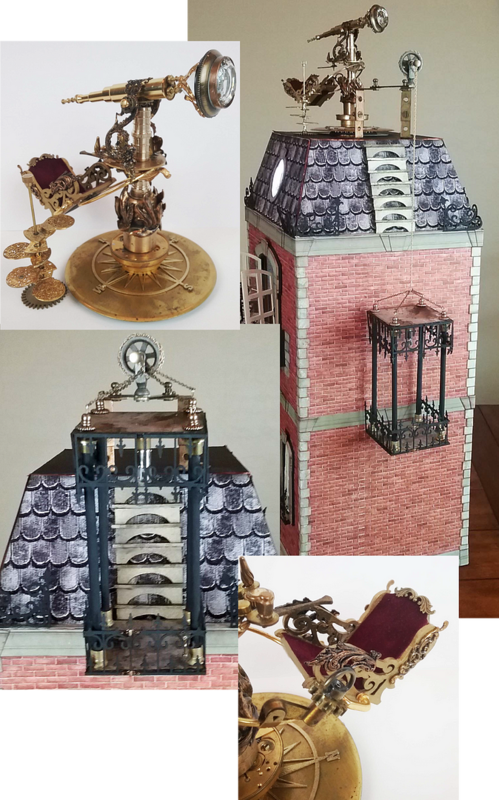 Next up are a few Halloween projects and then on to Dr. Whatsit's Steampunk Inventor House. Welcome back to the house on Irongate Street. 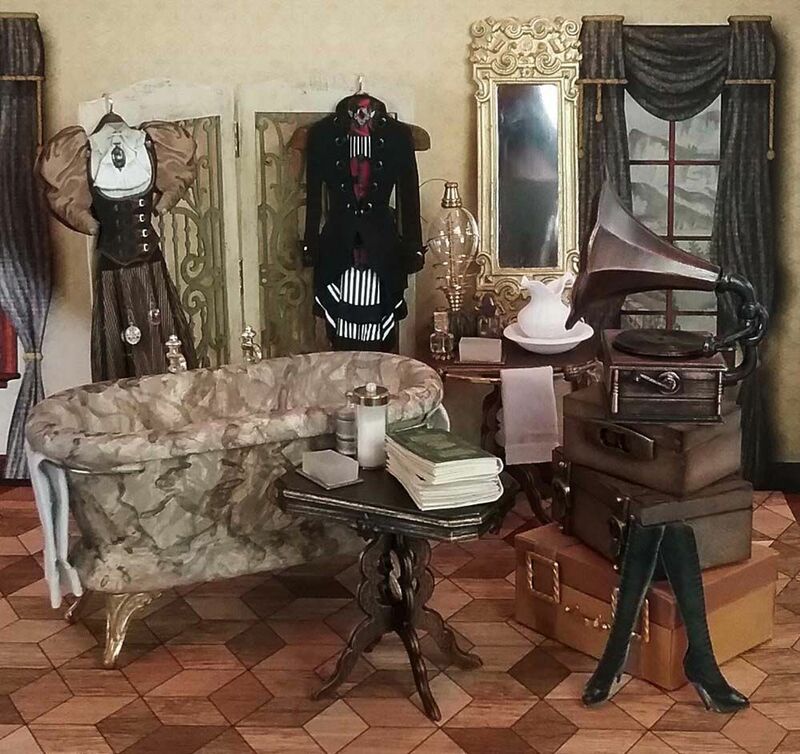 Looks like Helena has finished outfitting her second-floor boudoir. 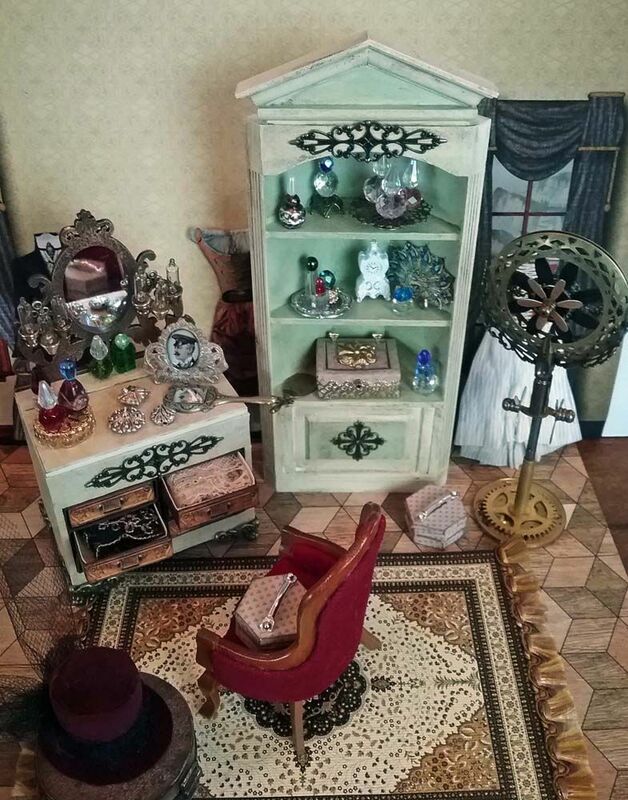 Just like the first floor, she has stuffed the room will all kinds of goodies. 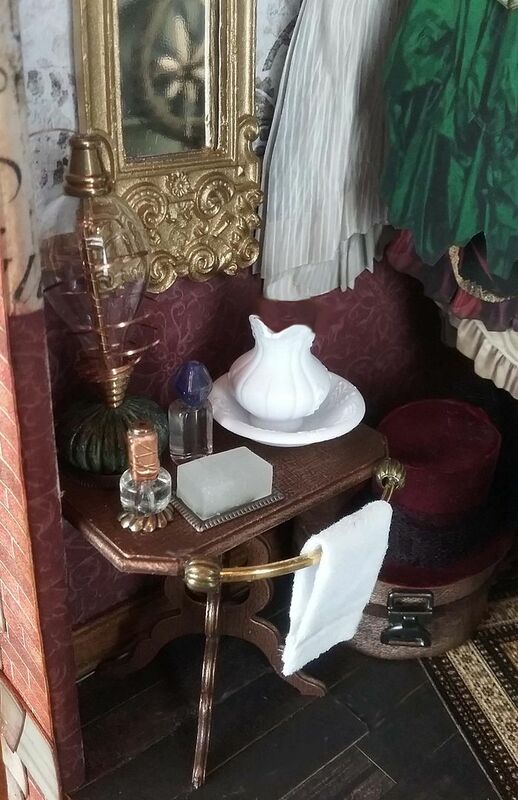 Notice the washstand with its Steampunk lamp, hanging towel & soap (which I’ll show you how to make). 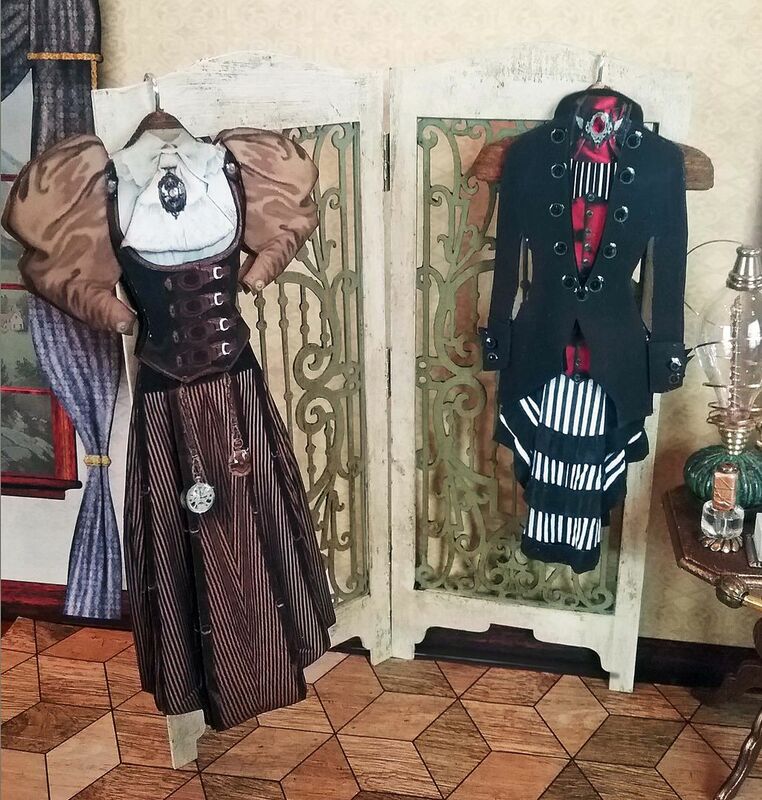 The room is packed with cool steampunk clothing some of which is hanging on a fretwork screen. 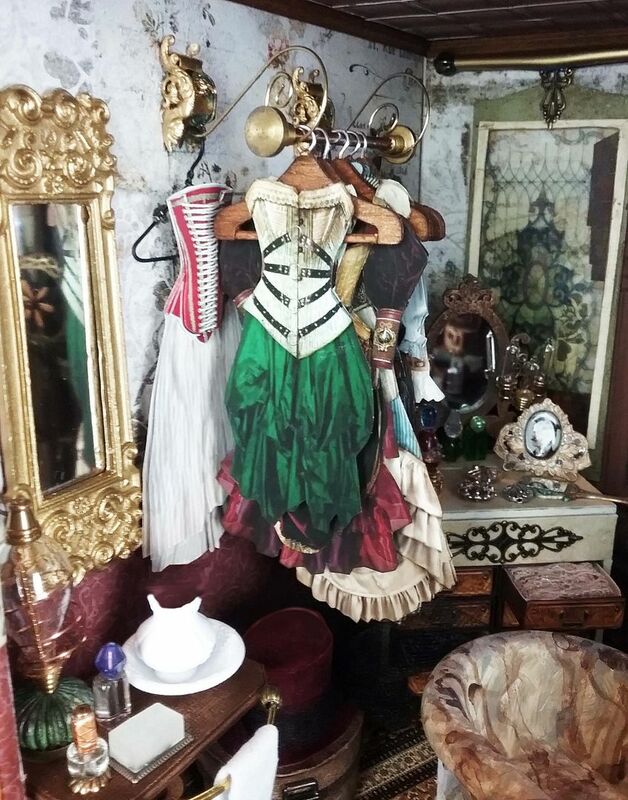 Some of the clothing is hanging on a wall rack, it looks like she’s quite the fashionista. 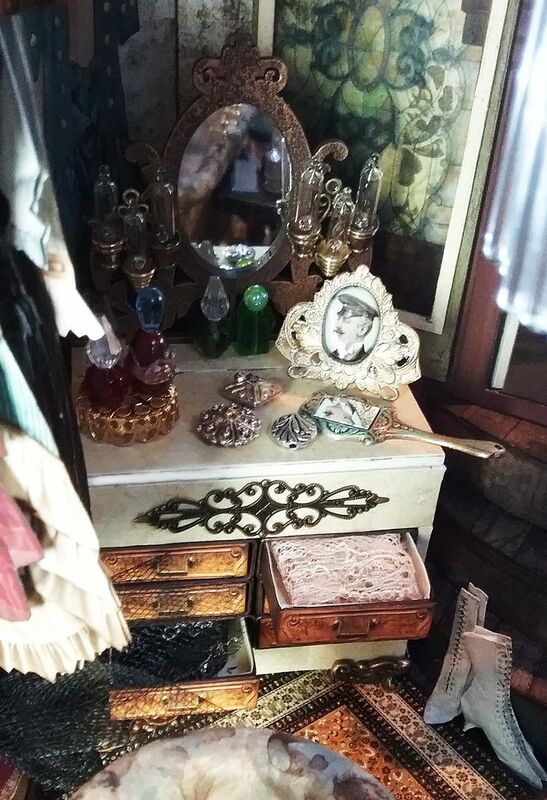 What a lovely vanity (made from a kit and matchbox drawers). 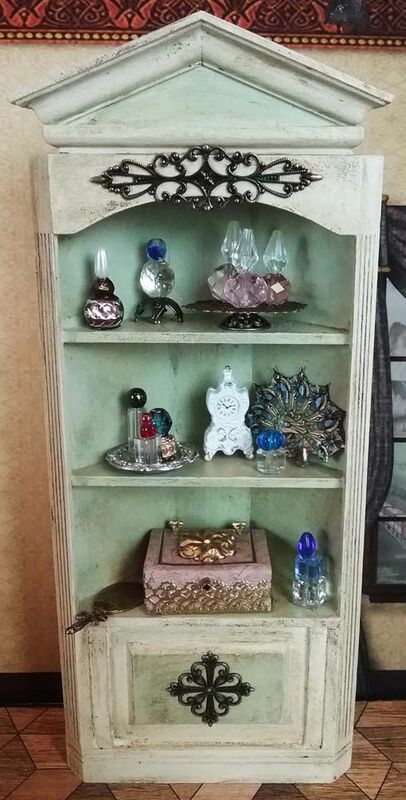 Flanking the mirrors are steampunk lamps and on the top are perfume bottles, powder boxes, and compact cases. 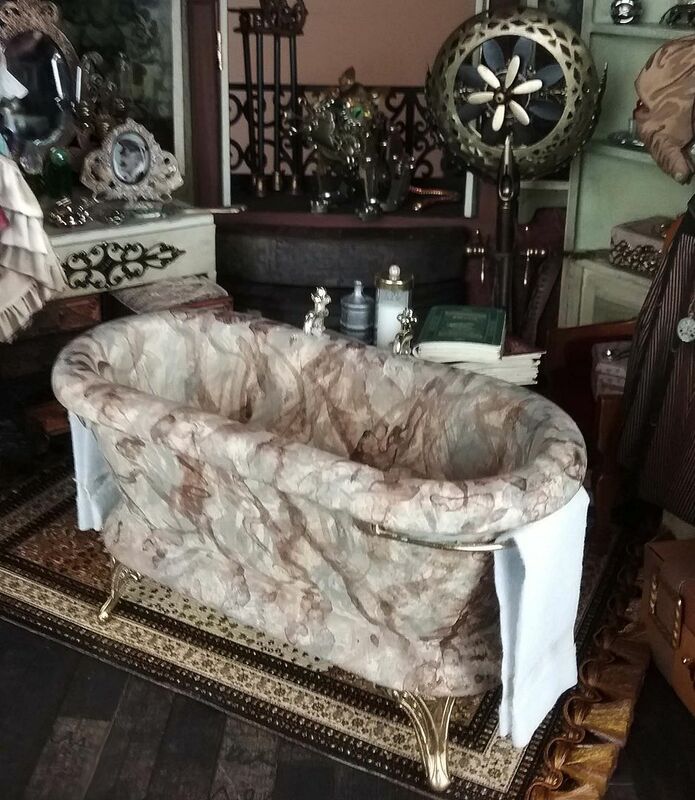 In the center of the room is a beautiful marble bathtub. In this post, I’ve included a separate Faux Marble Paint Technique video tutorial to help you create this look on miniatures or artwork. 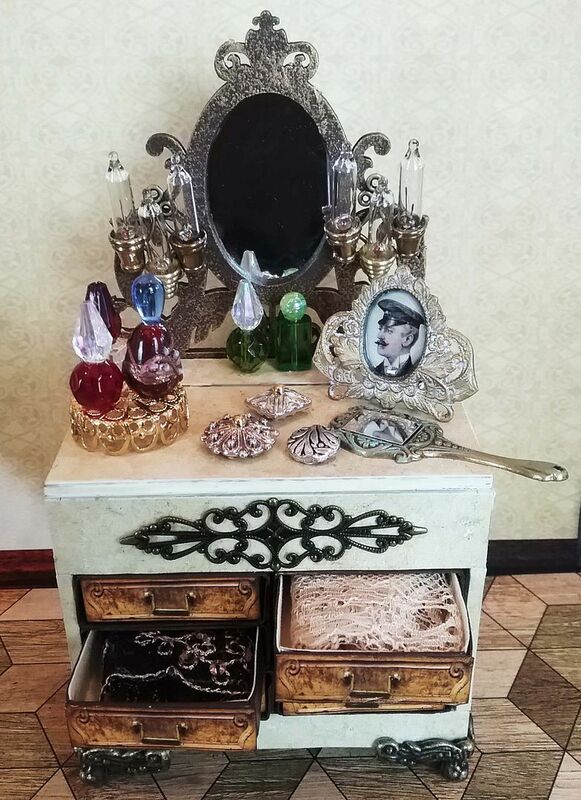 The cabinet in the back corner is loaded with perfume bottles, a lovely box, a fan, and a hand mirror. 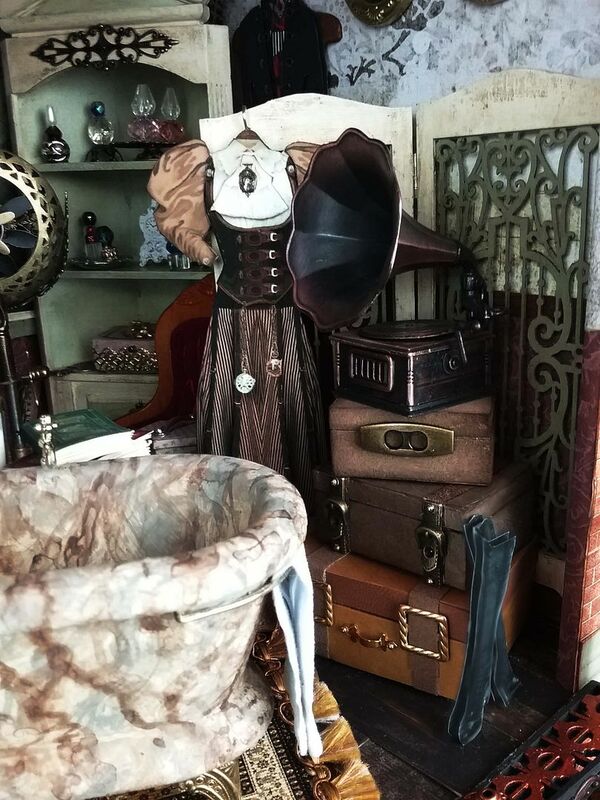 In the front of the fretwork screen are suitcases, a gramophone and a pair of boots. 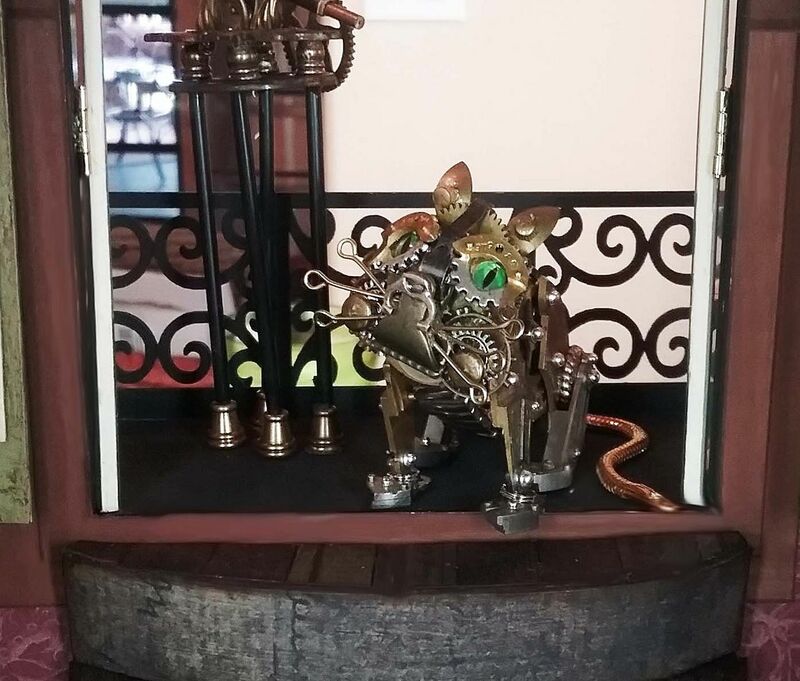 And there is Gizmo, Helena’s cat, sitting on the balcony. Check out the stain glass hanging screens that you can slide to open or closed them, they run on a track made from a straw. 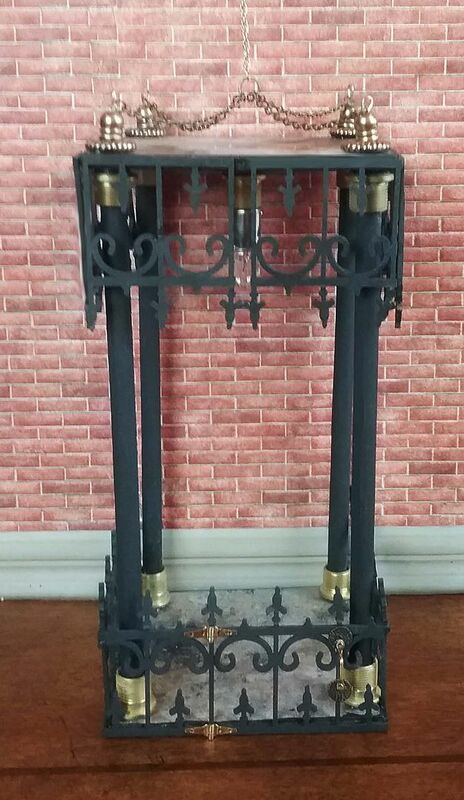 The frame of the screens is the same frame I used for the fretwork screen. In a couple of weeks, I'll be posting the last segment of the house on Irongate street which will involve the roof. 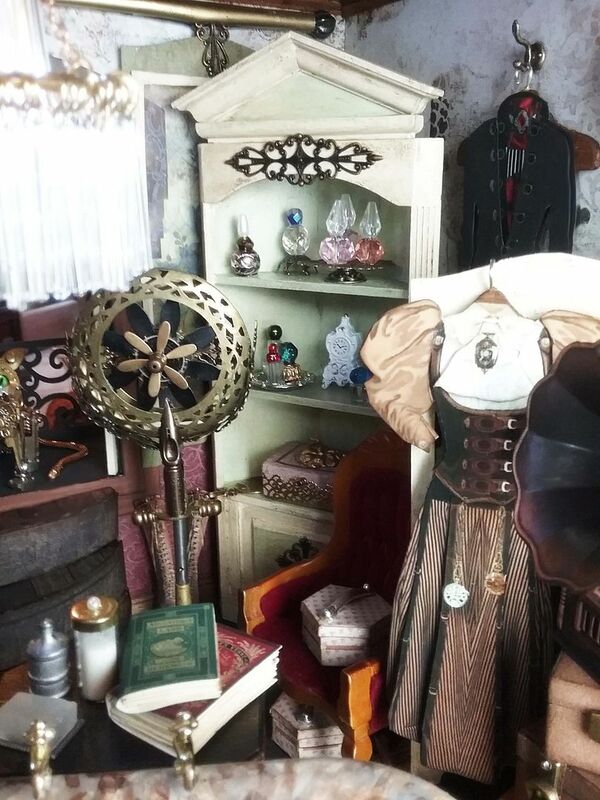 Then I'm going to take a break from Steampunk projects to tackle a few Halloween projects before returning with Dr. Whatsit's Steampunk Inventor House. 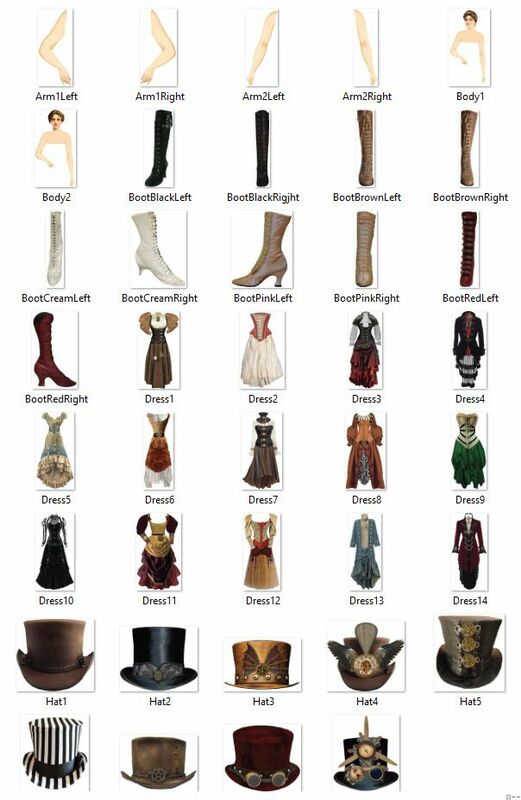 This collage sheet contains Steampunk dresses, boots & hats. In addition, I’ve included body parts for making paper dolls. 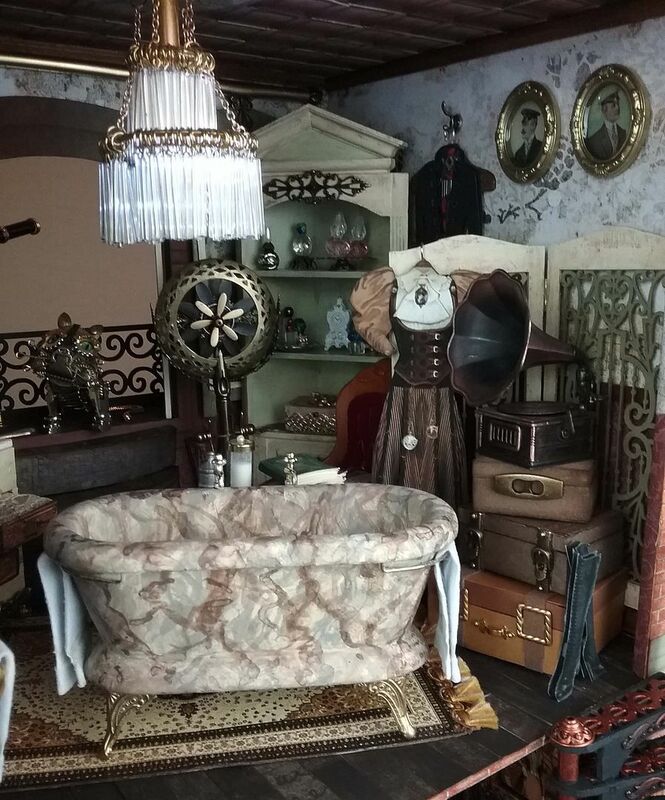 The images are sized to work with 1:12 scale miniatures. 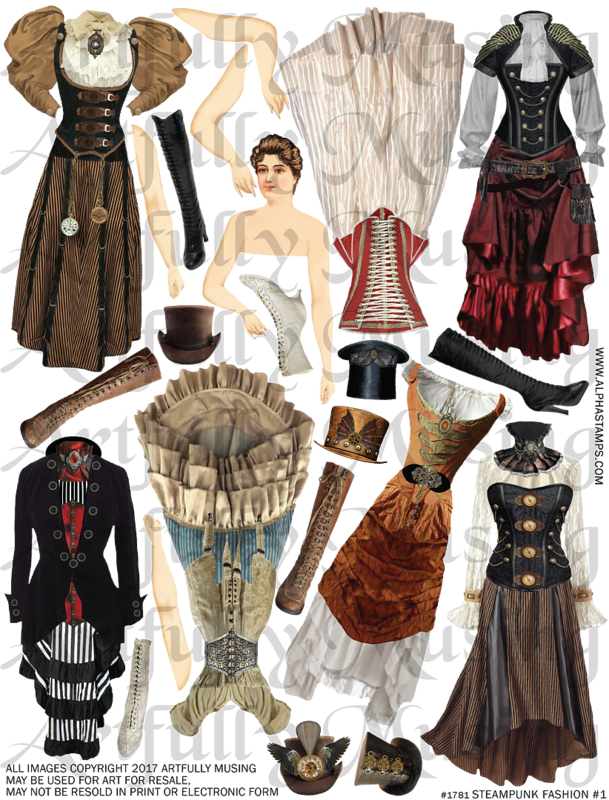 Just as with the Steampunk Fashions #1 Collage sheet, this sheet contains Steampunk dresses, boots, & hats. 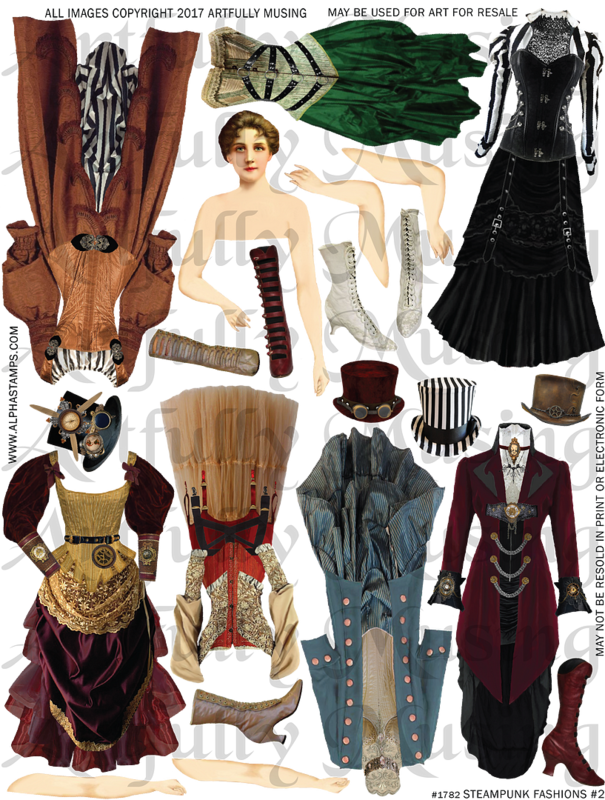 In addition, I’ve included body parts for making paper dolls. 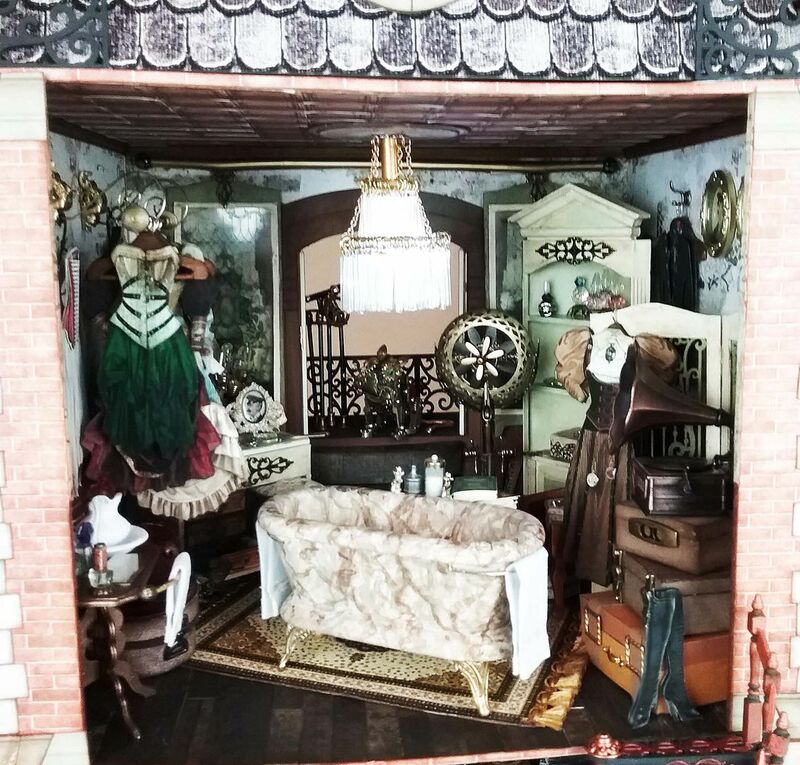 The images are sized to work with 1:12 scale miniatures. 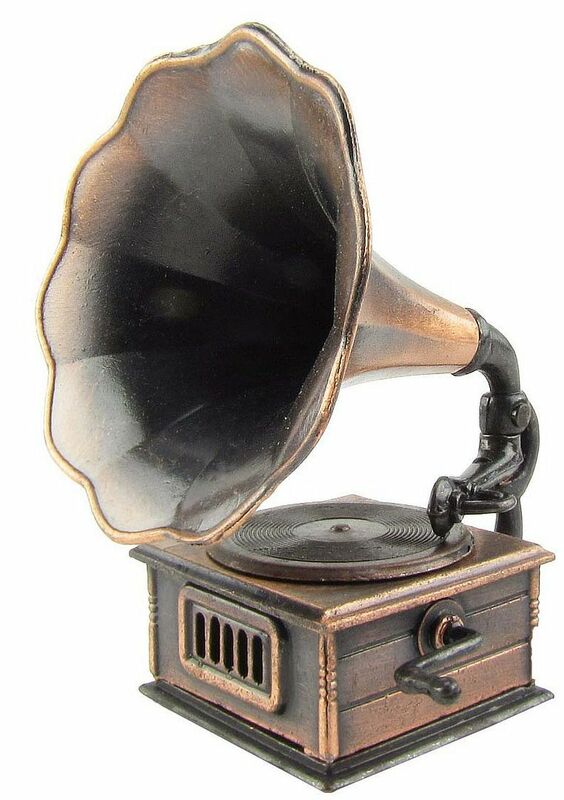 The company that carries the gramophone pencil sharpener is Treasure Gurus, LLC. 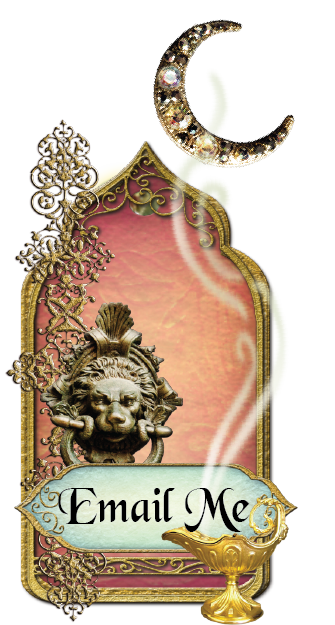 You can find it at Amazon and Walmart as well as some other online stores. Welcome back to the house on Irongate Street. Looks like Helena has made more improvements. 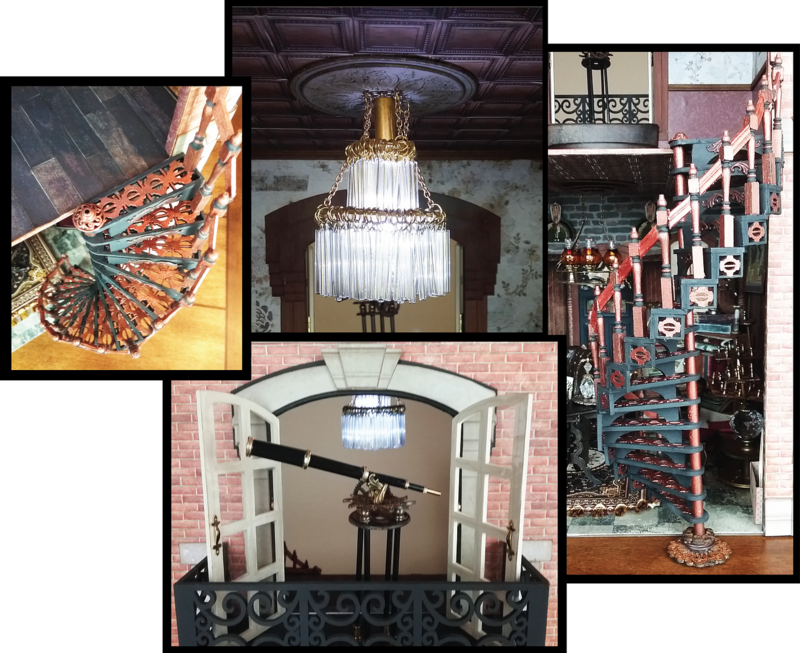 An absolute necessity is the spiral staircase going from the first to the second floor. It starts on the first floor and spirals up to the front of the second. The staircase design is versatile and can be used outside of the house (as in this example) or inside the house by cutting an opening in the ceiling. For this project, I chose to locate the staircase on the outside so that I would have more room for furniture. 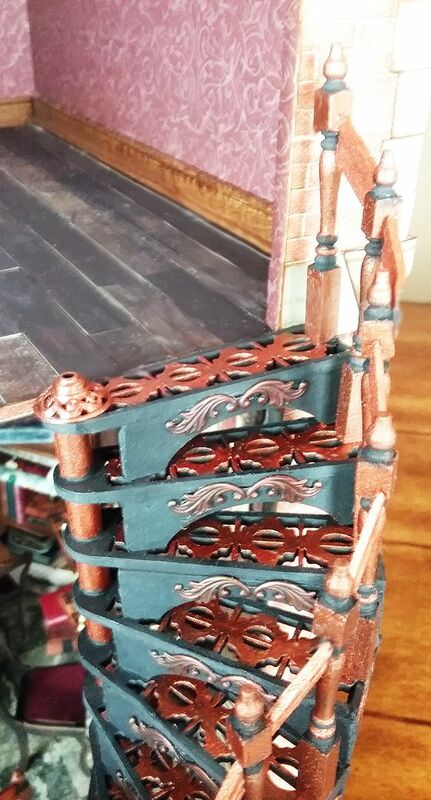 The staircase has beautiful fretwork details. The good news is that it’s akit, yeah for kits! There are so many things you can do to add a railing. 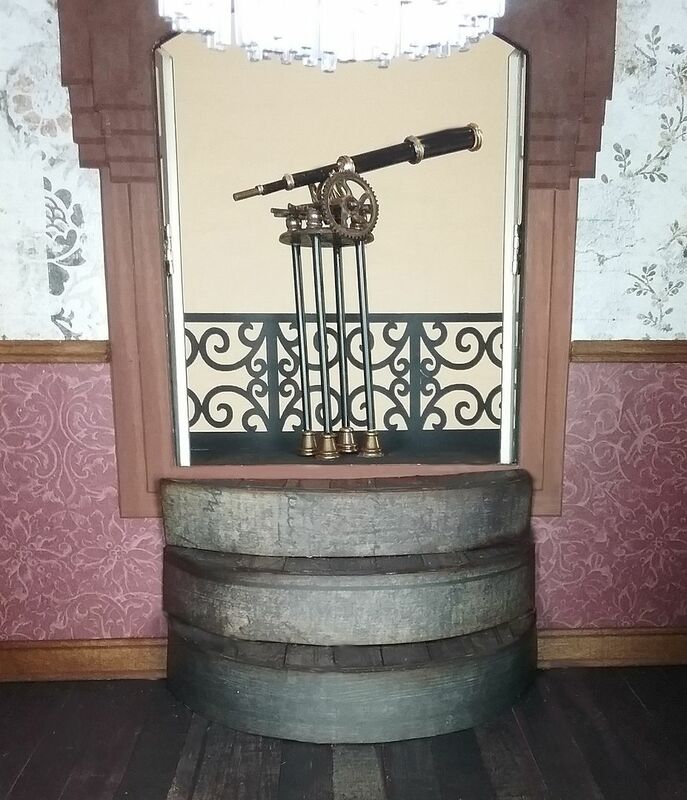 In this example, I’ve used wooden table legs as the spindles and cut pieces of wood chair railing as connectors. And for those who need a staircase for a different project, there is an add-on stair kit with extra steps that can be used to extend the staircase or add your own dowel and build a shorter staircase. There is so much flexibility with these kits. 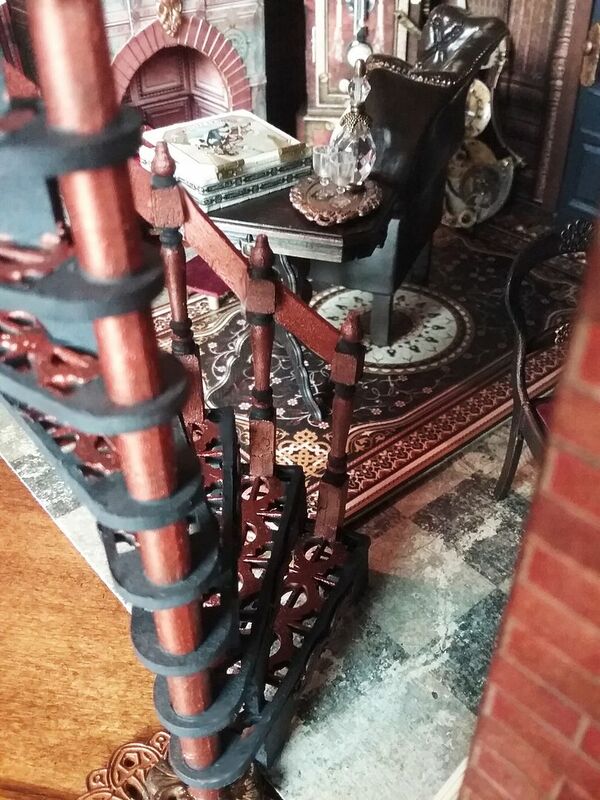 In future projects I’ll be remaking this staircase, demonstrating other styles and railing options (this isn't the only house I will be building). Upstairs you’ll find a lovely lighted chandelier. 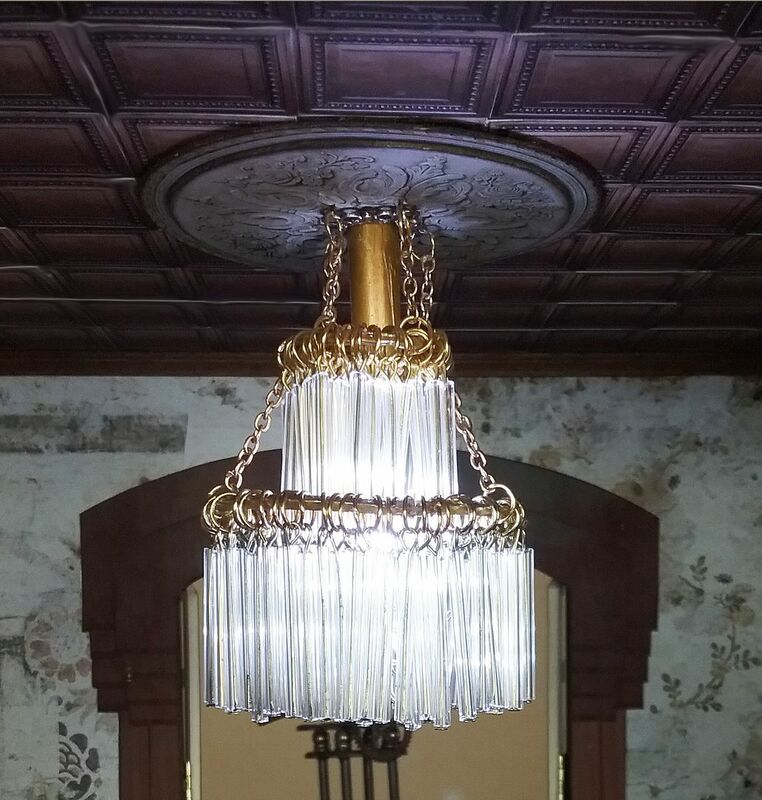 Helena thought the room needed some bling and this chandelier fits the bill. Notice how the light casts shadows on the ceiling. 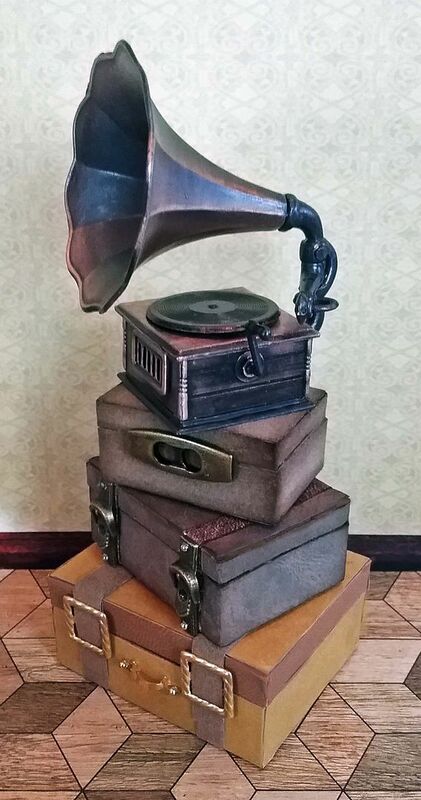 You’ll be surprised at how easy it is to make. 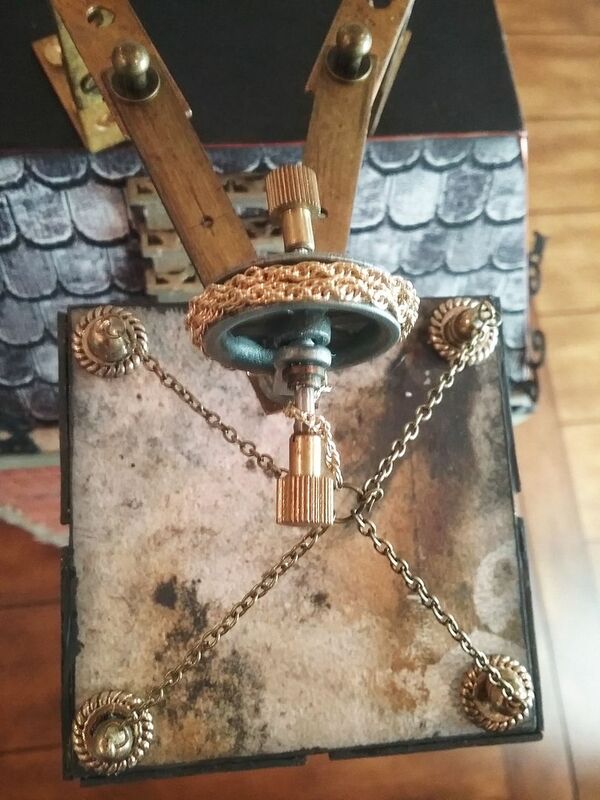 I used two different sized rings (an earring and a keychain ring) connected with a chain. Hung on each ring are lots of 1-inch glass bugle beads. The light comes from two sets of mini fairy lights. 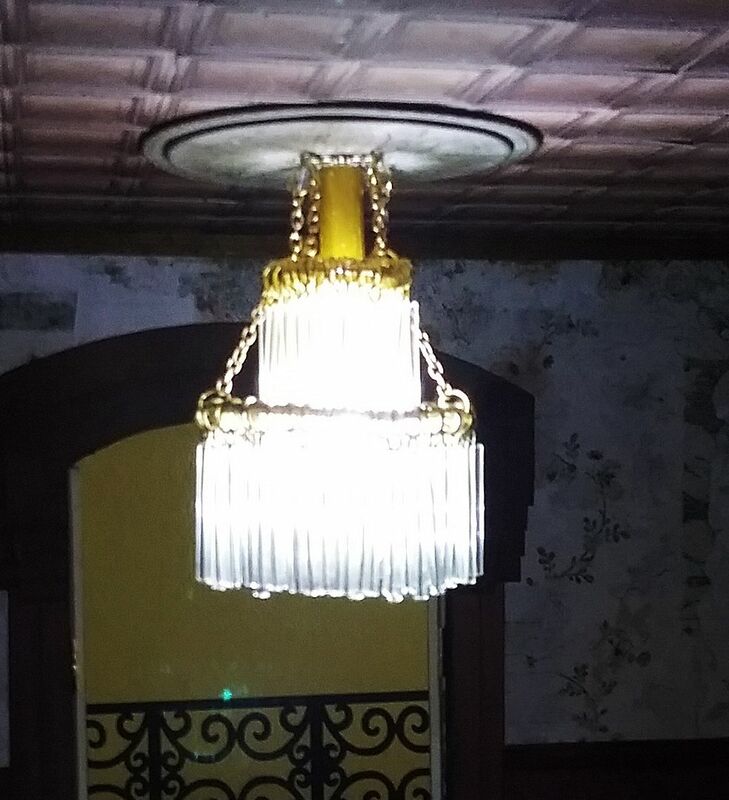 There is a hole in the ceiling where the strings of lights are inserted through a plastic straw down into the chandelier. 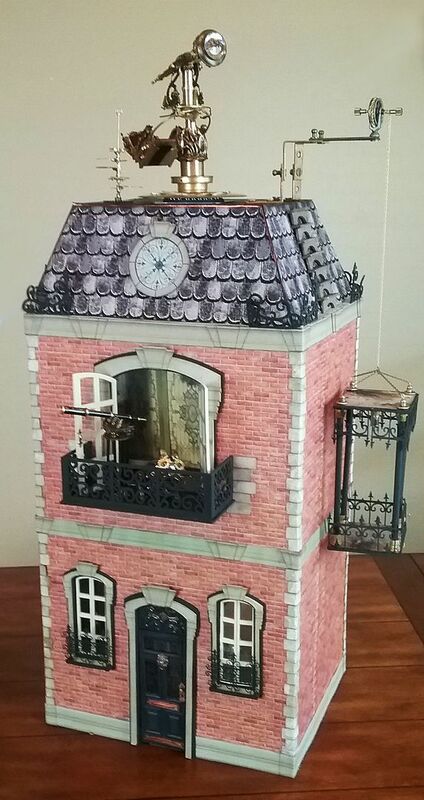 The roof hides the batteries and switch, allowing for easy access in turning the lights on and off. 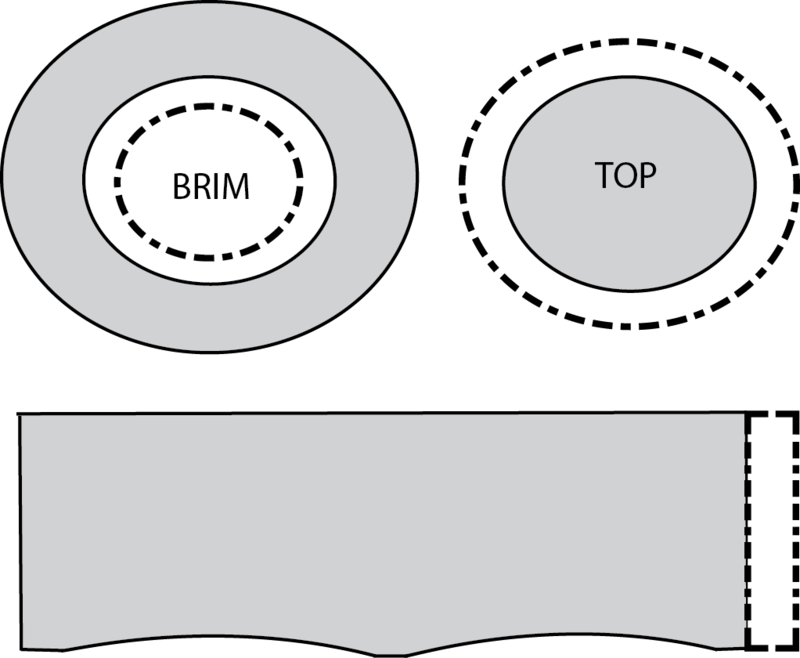 But don’t worry; in the video tutorial, I’ll walk you through the assembly. Out on the balcony is Helena’s spy scope, a necessity for any explorer. Again I have used one of my favorite construction materials, various sizes of plastic straws; yep, the scope and legs are made from straws. 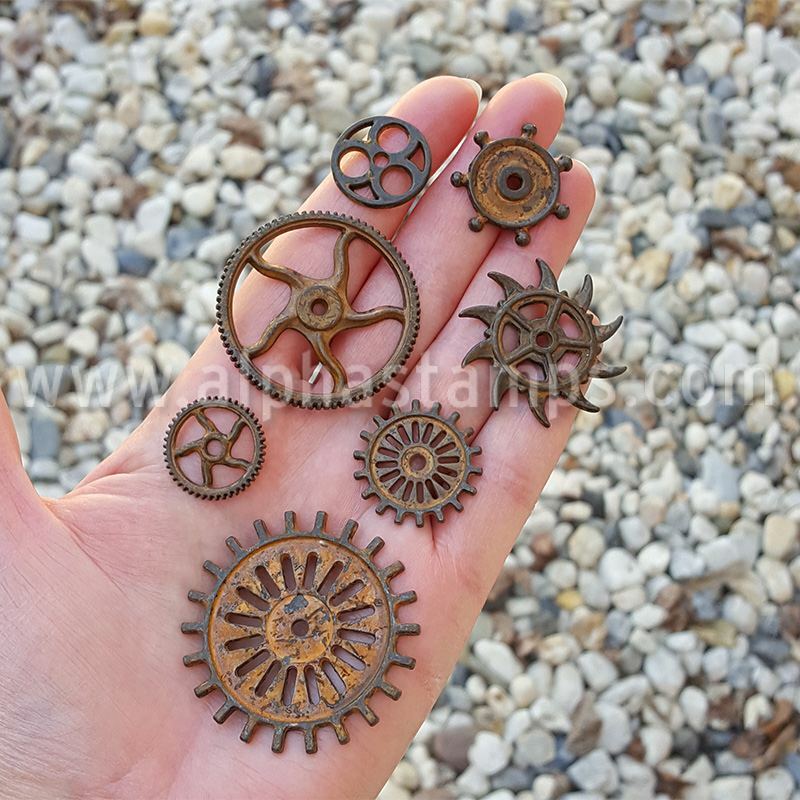 The cool rusted platform is made from Finnabair Mechanical Metals sets. 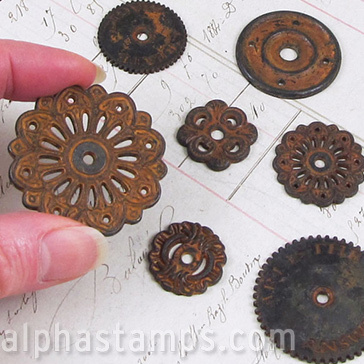 They come pre-rusted and various shapes. You’re going to see me use these repeatedly in future projects. 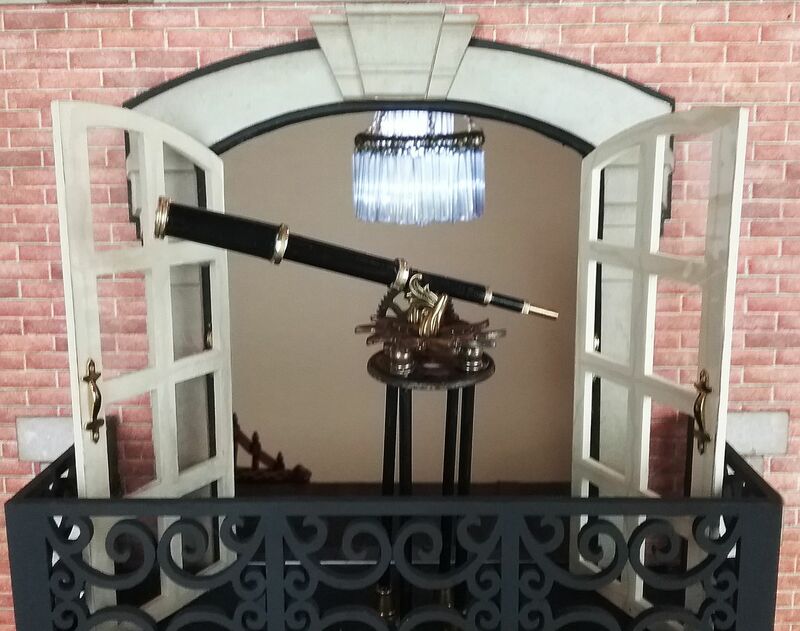 In this project, I also used them for the base of the staircase. 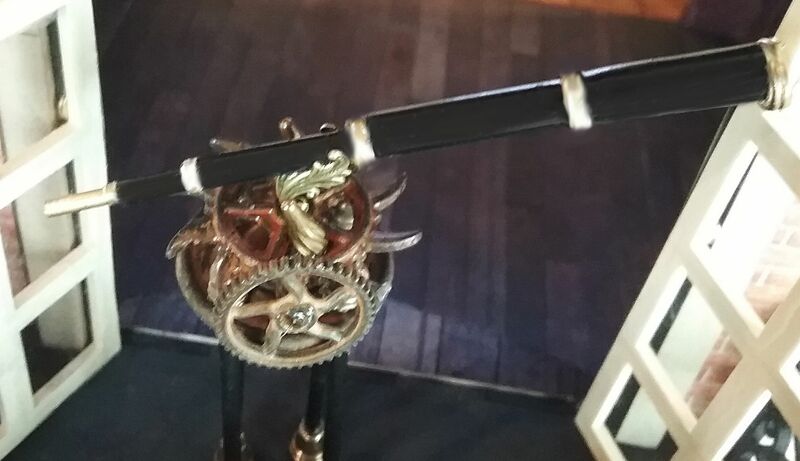 One of the Finnabair wheels and brass fluted dangles are used for controls and a bronze flourish (folded) is used to connect the scope to the base. When you first saw the house you might have wondered, “how in the world do you get up to the balcony”. 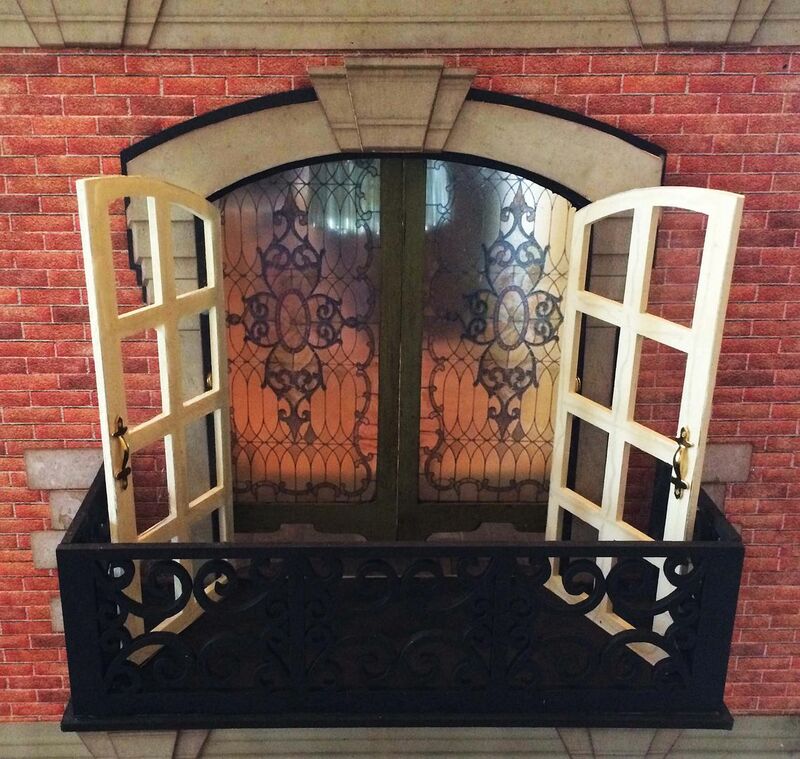 In the video, I’ll show you how to build a custom set of steps. I’ve included the template (at the bottom of the post). You might have noticed at the end of the last project post I indicated that decorating the second floor would be the next post. 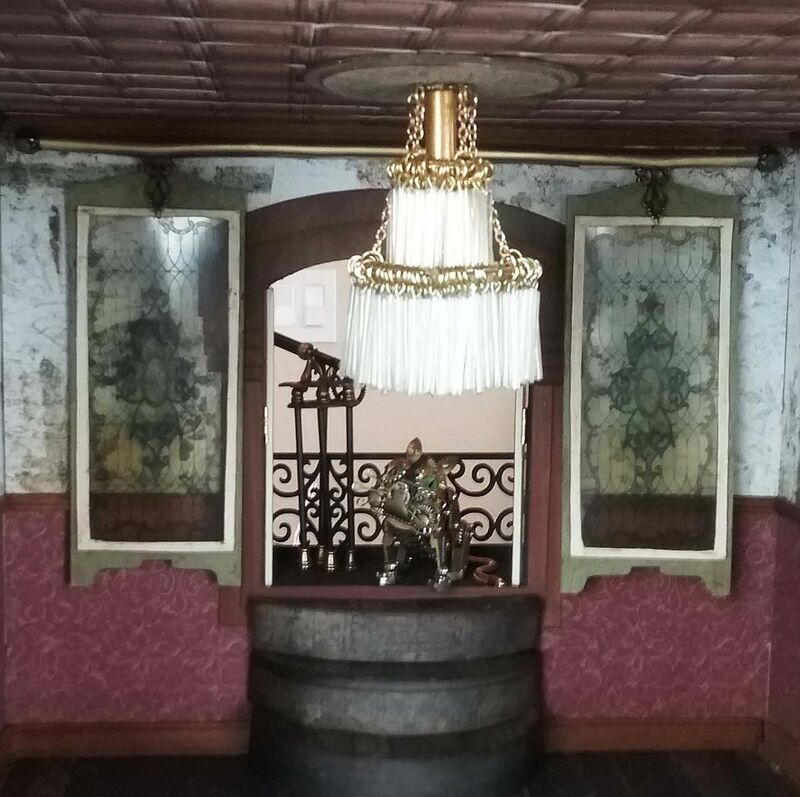 For timing reasons I decide to flip the posts and deal with the staircase, chandelier etc. first and the next post (I promise) will be decorating the second floor. Besides, there is no way to get up there without a staircase. 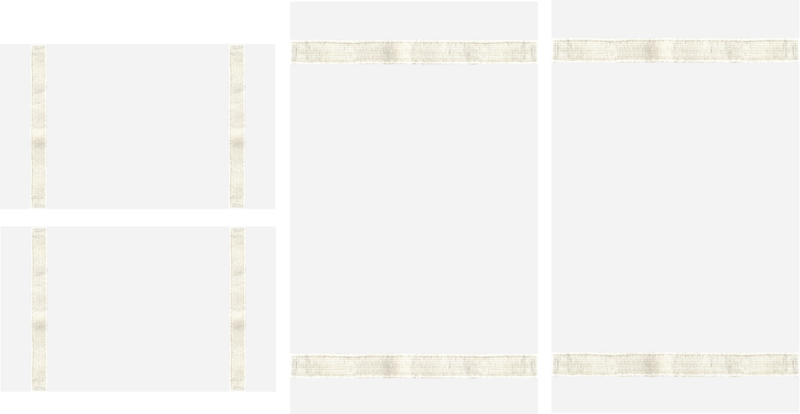 Below you'll find the video tutorial, link to a picture gallery, the balcony step template, and the complete supply list.